Last month we gave our living room wall a brand new look. 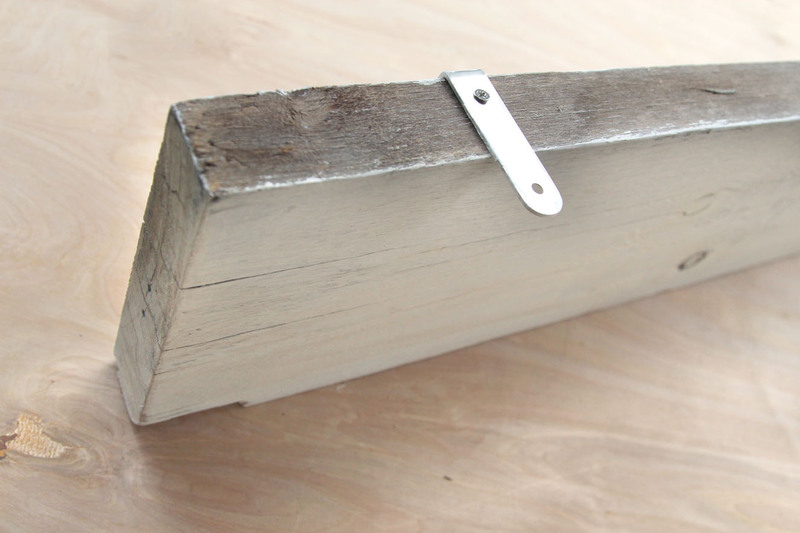 One of our favorite features are these faux DIY floating shelves. 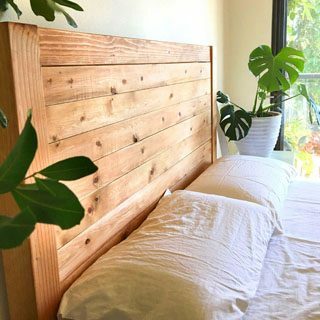 They are super simple to build, and provide the perfect spots for us to decorate the living room wall with pictures, plants, vases, and other favorite things! These wall shelves we built look like floating shelves, however, they are much easier to build, and cost only about $5 each! 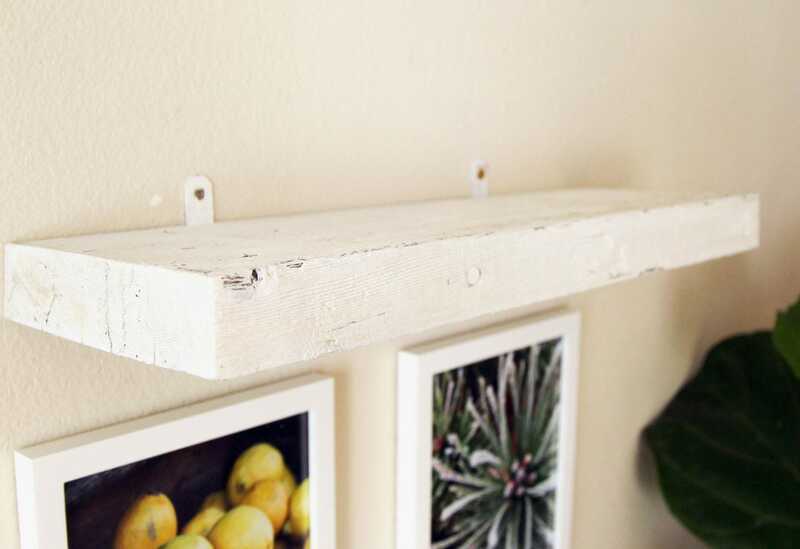 They are called faux floating shelves because any brackets supporting real floating shelves must be hidden within the shelves. These DIY wall shelves ( I will refer to them as floating shelves in this tutorial) are sturdy and quite versatile. We love them! 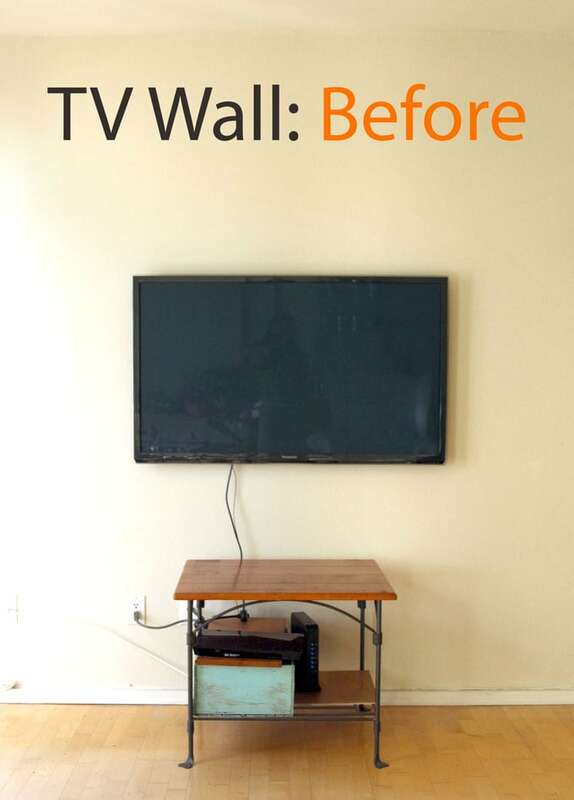 You can check out what a difference they made in our living room in this before after project. Ready for the secret of these faux floating shelves? 2×8 wood (actual dimension is 1.5″x7.5″ ) – We used 2 pieces of 2×8 leftovers at 22″ long and 30″ long, which are just what we need. A drill. The brackets come with screws and drywall anchors. 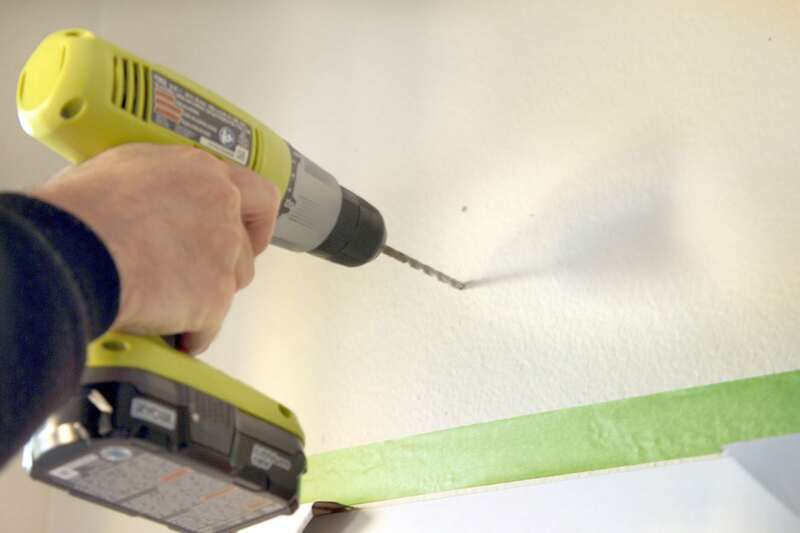 However, you might need a few extra 1.5″ to 2″ screws if you are drilling into studs instead of drywall. 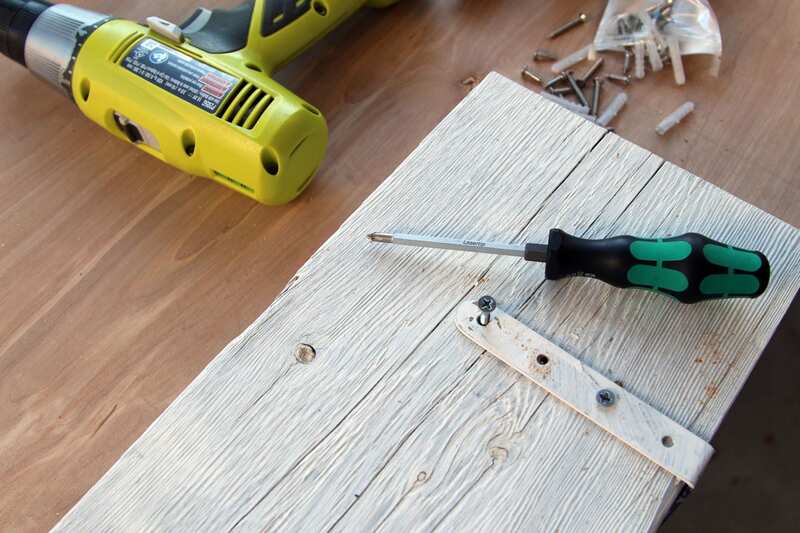 Here’s why: driving screws into wood without drilling pilot holes, will cause the wood to split and crack ( especially on good quality hardwoods like maple, walnut, etc), which means a much weaker connection. A screw has a center cylinder going down the middle of the screw and threads wrapping around that cylinder. When drilling pilot holes, the pilot hole drill bit should be the same diameter or slightly smaller than the center cylinder. 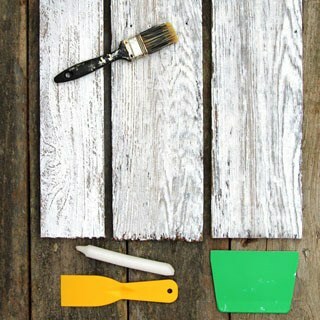 Step 1: Paint or stain the wood. Skip this step if you want to leave the wood as is. I painted the wood a solid white. 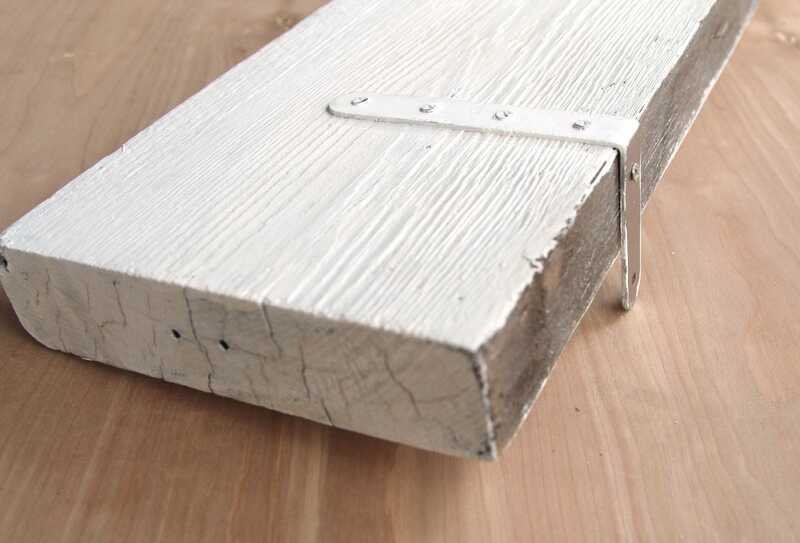 If you like a more rustic farmhouse style whitewashed look, here’s a tutorial on how to white wash wood in 3 simple ways. 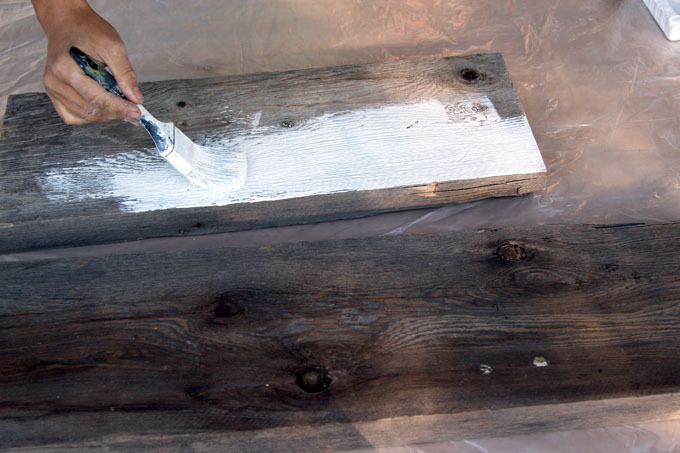 How to whitewash wood in 3 simple ways. Step 2: Attach brackets to wood shelves. The 5″x3″ L-shaped angle shelf brackets come with screws.In most cases these brackets are installed in a way that the entire “L” is visible on the bottom of the piece it’s supporting. We will be reversing it here so we create a minimal profile. Place the brackets a few inches from each end of the floating shelf, mark the locations of the screw holes. Drill pilot holes and screw the brackets to the wood. 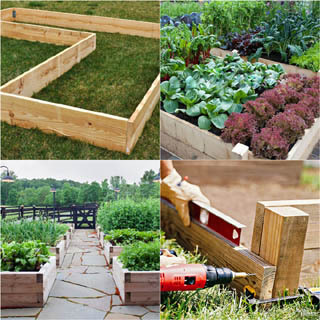 Use at least two screws on the bottom and one one the side as shown below. Paint the brackets and screws the same color as the shelf, so they almost disappear. Hold the shelf level, and mark the locations of openings on the brackets, drill pilot holes for the drywall anchors or the longer screws if it’s going into a stud. Screw the brackets and shelf onto the wall. Because there are only tiny bits of brackets showing, it’s very each to hide them with things on the shelf. I love mixing up photos with vintage books, art, plants, and other cute objects. 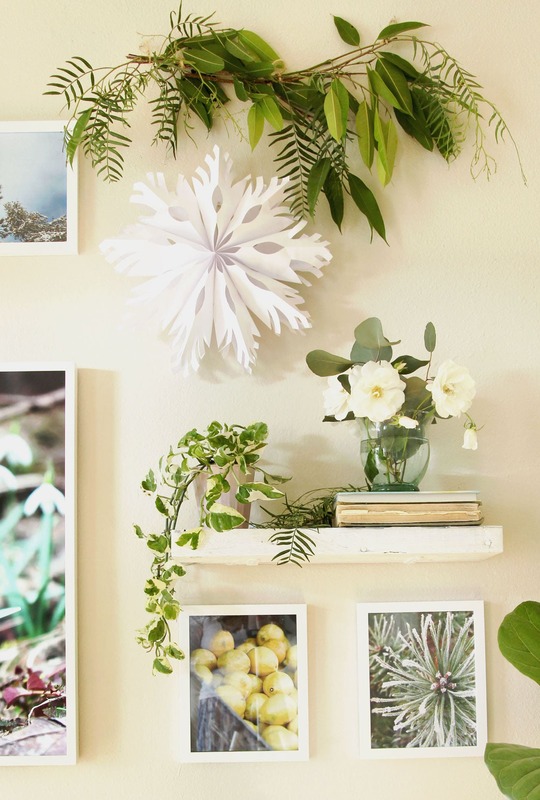 A floating shelf like makes it super easy and fun to change decor through the seasons. 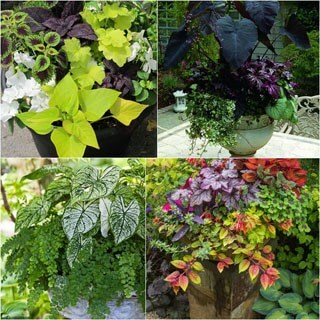 If you are wondering what all our indoor plants are, here’s a guide on the best kill-proof indoor plants we love! 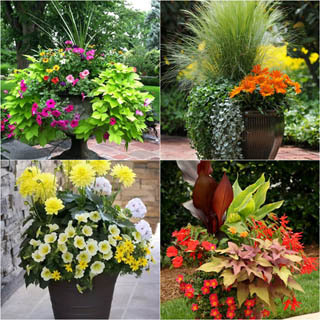 They are not only beautiful but also able to clean indoor air, according to studies by NASA! If you want to use wood stain instead of paint, check out this detailed tutorial on how to make easy and long-lasting DIY wood stains. If you left the wood natural or applied a stain, it’s a good idea to add wax or oil finishes to protect the wood from water or other stains. You can apply a natural wax to the wood at the end. 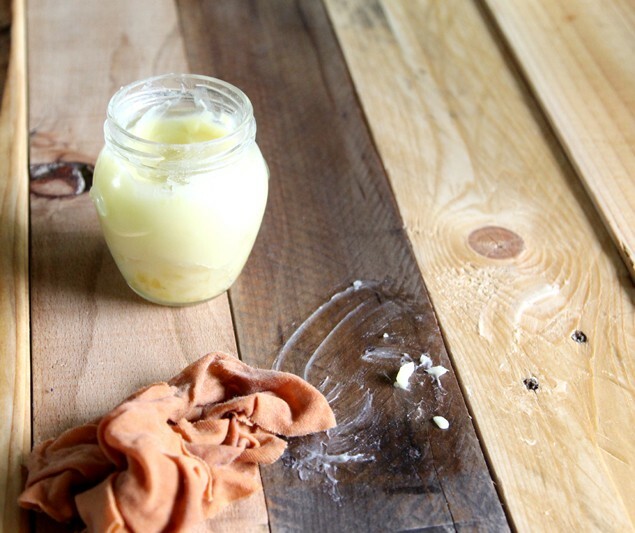 Try this fabulous 2-ingredient home-made natural furniture wax recipe here. You can also purchase the wax here. 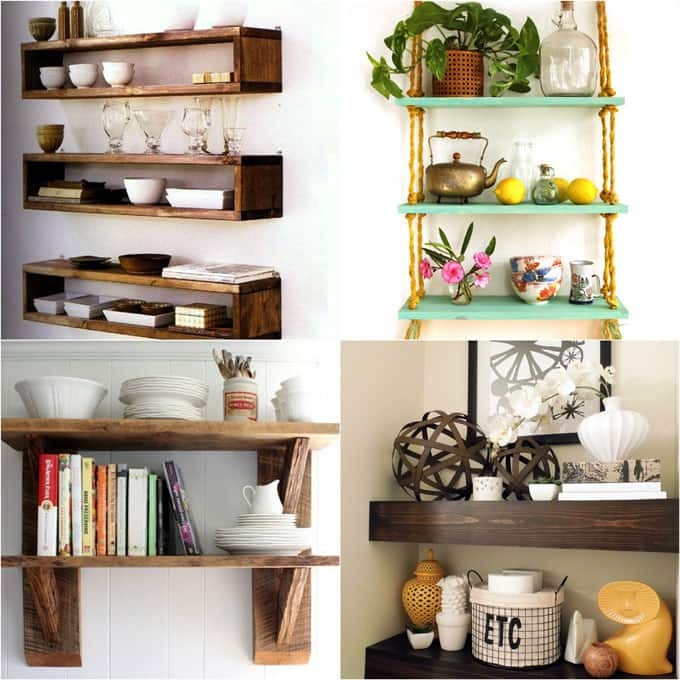 Love floating shelves? 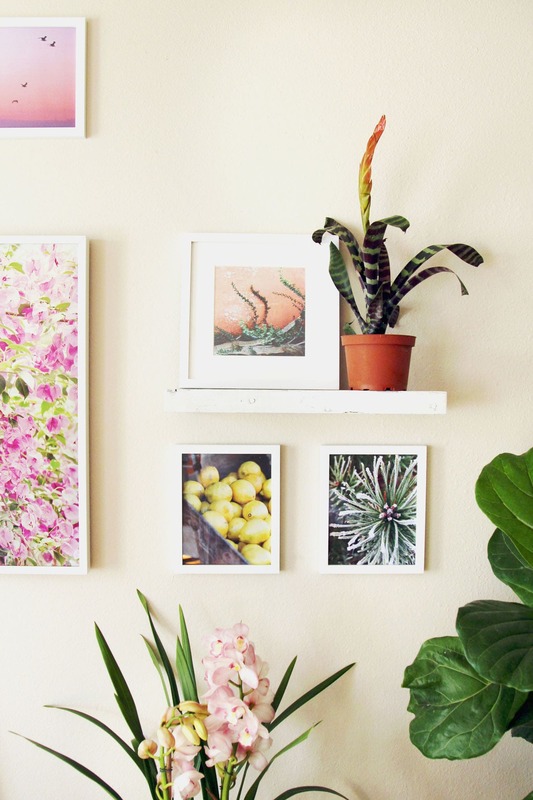 Here are 16 great DIY tutorials for you on how to build different wall shelves! I am so grateful for any DIY tutorial. I have been doing so good lately by what I have learned from all the posts. This one is nice and I will try it as well. I love these shelves! We have a few that are done in a similar way in multiple rooms in our house. 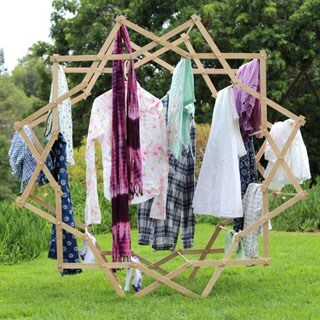 They look so nice and help give more organization, especially in the kids playroom! Those shelves look fantastic! this tutorial is very helpful for others looking for quick and cheap DIY shelving ideas. 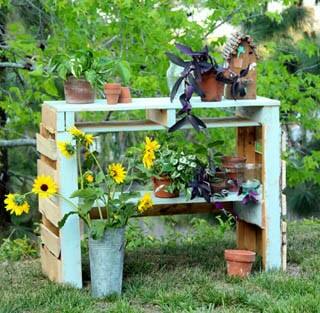 These are some great DIY wood staining ideas. I really like the floating shelves too. I have been wanting to do floating shelves for what feels like the longest time! 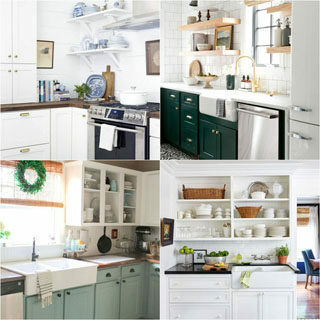 I love that white washed look too! Its rustic but still looks so clean! Thanks for sharing the tips on wood staining too! I always feel lost when it comes to that! Love how the space turned out! Super pretty. I love floating shelves though I don’t yet have any in my home. I think it’s fantastic that you painted it white. This is epic. 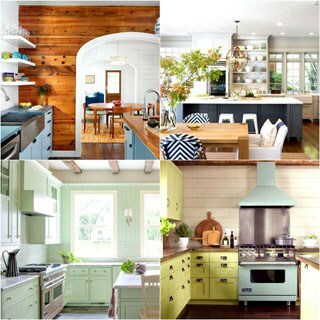 I especially love the idea of floating shelving! I’m moving into a studio soon and expect to be putting up a lot of these types of shelves. I was thinking of hiring a handyman to do it, but now I think I can do it myself. You make this all look so easy. I wish I was not afraid of the power drill. I actually love the whitewash wall. I have a great idea now to update my living room! I LOVE floating shelves! 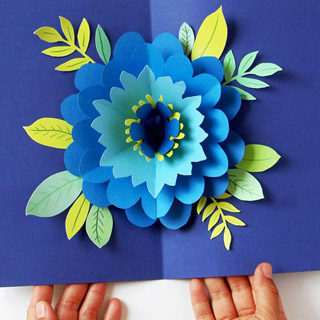 These look so lovely and the fact they’re so affordable and quick to do. 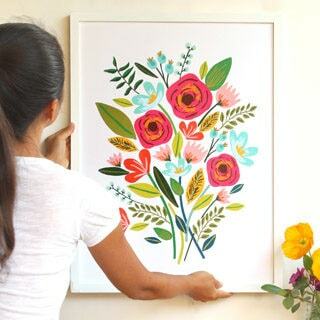 Oh my, I love how this DIY project came out! I might have to do this as well! Really clever! This makes putting up “floating” shelves really easy! Wow these look absolutely amazing! This looks like something that I could actually create. 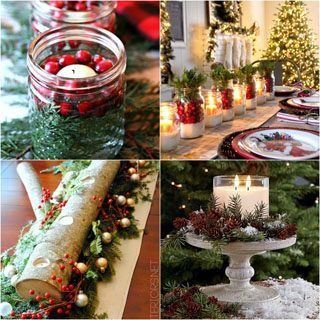 Looks amazing and pretty simple to put together! Awesome post! Will this hold a shelf of books? If not, how can I reinforce it? Great work! 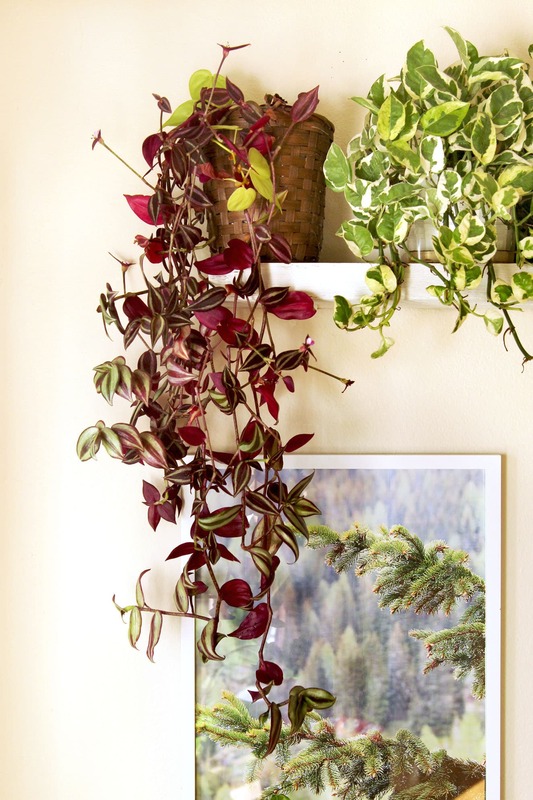 Floating shelves are a great place to store and show off your things. I got some wonderful ideas from your article. Thanks for sharing.